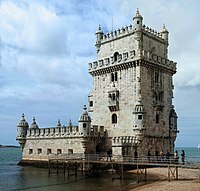 English: Manueline architecture, or Portuguese Late Gothic — a sumptuous composite Portuguese style of architectural ornamentation in the 1st decades of 16th-century in Portugal. It marks the transition from Late Portuguese Gothic and Mudéjar architecture to Portuguese Renaissance architecture. Construction in the Manueline style was largely financed by proceeds of the lucrative 'new' Portuguese spice trade with Africa and India. Pages in category "Manueline architecture"